LANSING (AUG. 14, 2018) — Since the start of 2017, more than $5 million has flowed to Michigan officeholders’ leadership PACs, fundraising accounts that can accept unlimited contributions. While leadership PACs have been around for years, they’re raising more money than ever before. And some of them are attracting individual contributions of more than $30,000. Usually, officeholders in powerful positions or those campaigning for high-ranking jobs are able to raise the most money for their PACs. They use the money to fund like-minded candidates who can support their bids for leadership positions or to invest in races that are key to their party’s chances of winning a legislative majority. While there are limits on what donors can give candidates for their own campaigns, officeholders at the state level in Michigan can raise unlimited amounts through their PACs and then spread the wealth around. Since the start of 2017, the officeholders who’ve raised the most money through leadership PACs include a candidate for leader of the House Republicans, a candidate for leader of the Senate Republicans, the current Senate GOP leader and Gov. Rick Snyder. 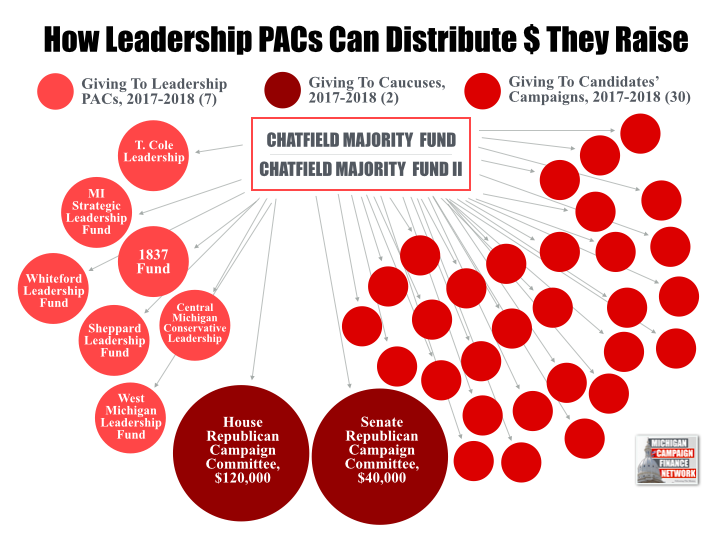 The top PAC fundraiser, House Speaker Pro Tem Lee Chatfield, a Republican from Levering, has raised $750,605 and given more than $455,550 to GOP candidates and causes since the start of 2017, according to campaign finance disclosures. 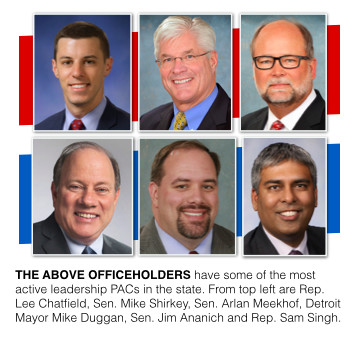 The 10 most active leadership PACs in Michigan have combined to raise $3.5 million from Jan. 1, 2017, through July 20, 2018. Among them are eight individual leadership PACs that have raised more than $200,000 each. Over the same period before the 2016 election, only four leadership PACs had raised more than $200,000 each. Over the same period before the 2014 election, only one leadership PAC had raised more than $200,000. You research the top donors to all state officeholders who have leadership PACs here. The following is a list of the 10 officeholders who have raised the most money through their PACs since the start of 2017 and where the money has come from. Position: He is the current House speaker pro tem and is expected to be the next House speaker if Republicans maintain their majority. Position: He is a member of the state Senate who will likely be the next Senate majority leader if Republicans maintain their majority. Position: He is the current Senate majority leader. Position: He is the top state official in Michigan. Position: He is the speaker of the state House and a candidate for attorney general. Position: He is the mayor of Detroit. Position: He is the assistant majority floor leader and is expected to be part of the future Senate GOP leadership team. Position: As House minority leader, he is the highest ranking Democrat in the state House. Position: As Senate minority leader, he is the highest ranking Democrat in the state Senate. Position: He is the vice chairman of the Senate Appropriations Committee.